A few weekends ago, Dartmouth’s campus was embroiled in cold war. No, it had nothing to do with Putin, nothing to do with Russia; nothing, in fact, to do with diplomacy (that is, unless you count negotiating due dates). Put aside all thoughts of Stalin and spy planes and focus instead on Darth Vader and lightsabers: Dartmouth’s 2018 Winter Carnival, “Snow Wars,” ruled the day. Skiing, skating, and sledding; ice sculptures, snow sculptures, and hot chocolate: think of what you’d expect from winter in the White Mountains, and Winter Carnival puts it front and center. But then think of polar plunges, human dog-sled races, and—if you can believe it—a beach party that’s been going every year since 1976. From morning to, well, early the next morning, Winter Carnival is a non-stop celebration of everything winter has to offer. Begun in 1910, Winter Carnival has a different theme every year. If you visit campus, check out the stairwells of Collis Student center (or, now that I think about it, Google) for posters through the years. (Shout-out to Mr. Youker ‘92, my high school physics teacher, for designing three of them!) For decades, Carnival — called “Mardi Gras of the North” by National Geographic) was so popular with students from colleges throughout the northeast that schools would send trains or buses full of them. Now, you’re less likely to find someone without a Dartmouth ID, but it’s still a great weekend to invite your high school friends to visit! Unfortunately, this year I wasn’t here for it. I had to bear parks whose only “snow” was snowdrops—tiny white flowers in fields of green—as I ran, lost in wintery nostalgia, as sun shone, bright and warm, on my face… Just kidding. I’m in England. It was cloudy. 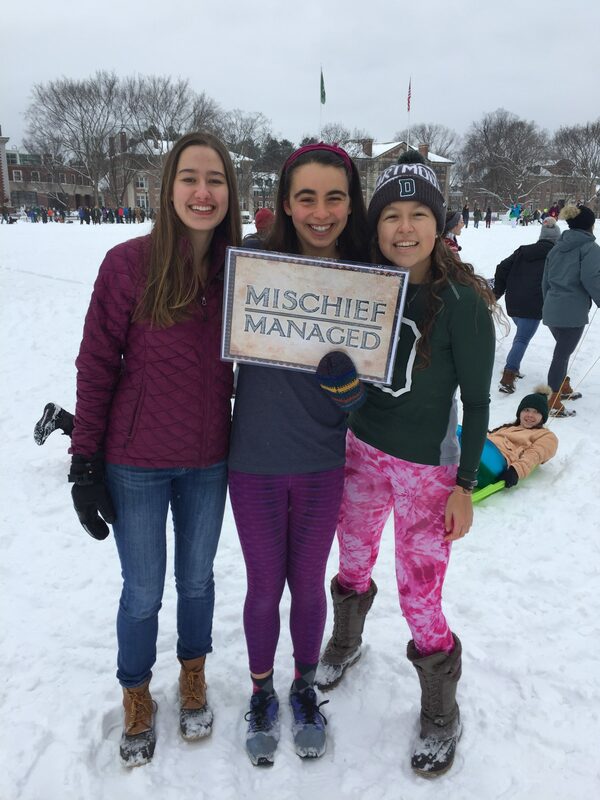 But the fact remains: Winter Carnival (then themed “Dartmouth School of Icecraft and Blizzardry,” aka Harry Potter) was my favorite “Big Weekend” of my first year. Both day and night, the escapades were a fantastic break from everyday routine — and forged two (or more!) of my closest friends from my first year. 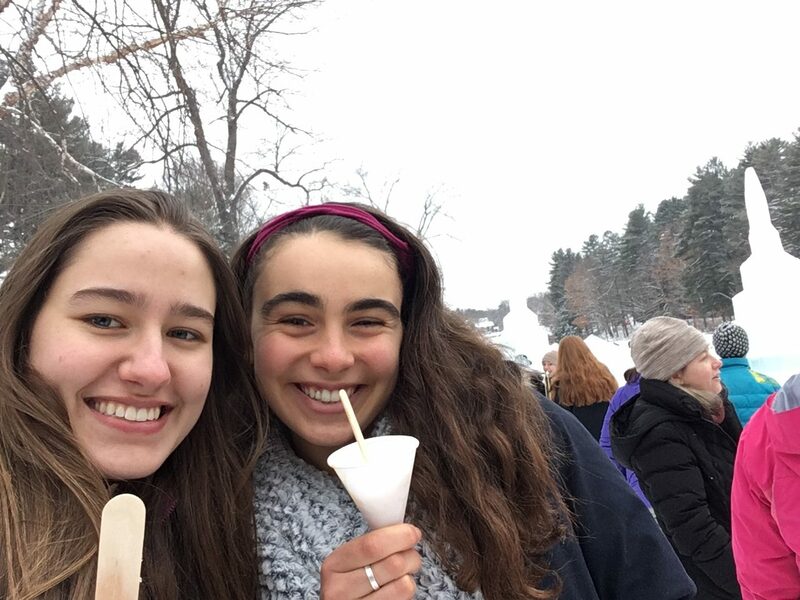 From crafts and cocoa to dog-sledding and dance parties, Winter Carnival — whether themed for Harry Potter, Star Wars, or anything else — is a perfect example of how Dartmouth embraces what nature throws at us.